That blurred piece of aspen pole at upper left is the dog's goal. The big yellow Lab is swimming hard through the white water, but it's his four legs against the cold, fast-moving Arkansas River. A hundred yards downstream, he goes over the little dam and into the froth of the kayakers' "play hole" at the F Street Bridge in downtown Salida, Colorado. M. averts her eyes, afraid he is gone for good. But the dog's head pops up again, the fluorescent green retrieving dummy still in his teeth. He scrambles onto the riverside boulders and starts up back toward us. There is applause. 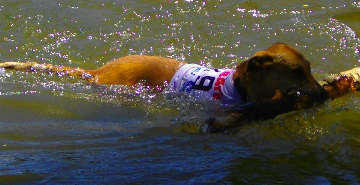 Some dogs wore racer's bibs, no less. A stadium wave passes through the crowd as people stand to let him pass. The clock is still running for him. 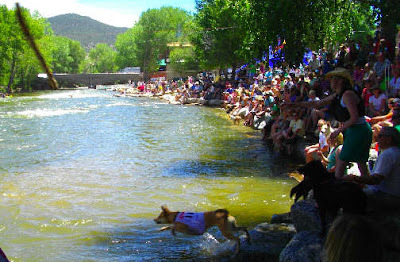 By the time he delivers the dummy to the middle-aged man with the prosthetic leg, his time on the retrieve has passed one minute, which means he will not place in the money at the Puff Memorial Crazy River Dog Contest, part of the annual (since 1949) FIBArk whitewater boat races on the river between Salida and points downstream. Next to us, Boone, a chocolate Lab, big in the shoulders, whines and shrieks much like my young Chessie, Fisher, would do if he saw other dogs retrieving what he clearly believes to be HIS sticks and dummies. Finally, Boone is up and makes brisk, workmanlike retrieves, spending the minimum time in the fast water, but they are good enough only for second place, even though he swims with such strength that his shoulders rise from the water. He is a regular competitor; I noticed his power four years ago. You can tell that some contestants are not used to retrieving in moving water--they swim to where the stick/dummy/ball was, rather than to where it is a few seconds later. The smart handler is the one who tosses a deflated soccer ball for his dog--it floats high, and the dog sees it and pursues it in the current, making a successful grab.